Feelings: Tazza is a modern and cozy neighborhood enoteca/cafe/bakery that is famous for their coffee and pastries as well as wine and savory dishes. They have a large selection of panini, and I was mostly excited to see nutella panini on the menu. The place has a nice loungy atmosphere with quintessential Brooklyn Heights vibe, but I prefer to do a quick coffee and pastry take out on my way to the train station. Their coffee is slightly cheaper than Starbucks but possesses far better aroma and flavor. With a hand written note in the window stating "Absolutely NO Computers," you can tell this is no Starbucks. 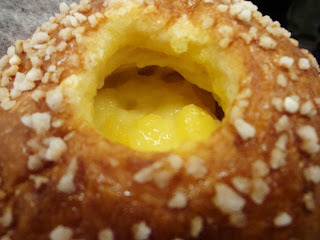 While I am determined to try nutella panini in near future, RB and I tasted custard brioche this time. It was deliciously fresh bread with subtly sweet custard cream. 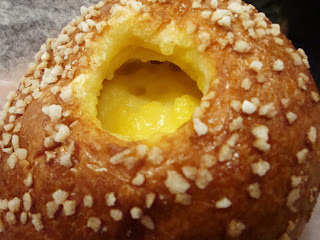 I enjoyed scooping out the cream in the middle with little pieces of torn off brioche. It was a little fun and sweet bread bowl of heaven. Tazza will be my neighborhood staple, and I will continue to try their various pastries and sweets. Oh I love this neighborhood! Custard is so tasty! This place is on my list. Just tried Beard Papa's for the first time and was not disappointed. gabriel byrne supp goes there (tazza, not beard papa) a lot, so you may see him there!